The Timeshare Ambassador: Trick or Treat? I don't know about you, but I love a good scare. For me, there is nothing as life reaffirming as getting the bejeezus scared out of yourself every now and again. And 'tis the season for just such misadventures. That's right, All Hallows Eve, Halloween, All Saints Day, Día de los Muertos (Day of the Dead), or whatever you want to call it is upon us. And while for some it means turning out the porch light and pretending not to be at home when the trick-or-treaters come calling, for me it is all about having a scary good time. Hey, did you know that Halloween is said to have originated with the ancient Celtic festival of Samhain? Yeah, it roughly translates to "summer's end," which sounds harmless enough, but its purpose was to demarcate the "light half" of the year from the "dark half". During this special time of year, Celts believed the line between the worlds of living and the dead became very thin, allowing spirits (good and evil) to pass through from one to the other. Man, that makes the hair on my neck stand on end just thinking about it. Some great places to fulfill your fright quotient also happen to have great timeshare rental options nearby. For example, you should check out the Queen Mary's Dark Harbor in Long Beach, CA. The famous ocean liner makes its permanent home here, and during the weeks around Halloween it is transformed into a macabre spectacle of demons, undead, and the like. According to their website, the Queen Mary steams into a harbor of the damned, a decidedly demonic destination, and serves up to 45,000 scares per hour, 160 monsters, and 20-foot tall flames. That's what I'm talkin' about! You can base yourself out of an Anaheim timeshare and be within close proximity to grim death, Disneyland, Knott's Berry Farm, SeaWorld, Universal Studios, and about a million other things to do in the greater Orange County area. California is also home to The Haunted Hotel, the longest running haunted house in San Diego. To get some idea of the fear factor involved in this attraction, check out this warning from their website: "All patrons enter at their own risk. This attraction contains high impact scares and strobe lights which may not be suitable for people with heart conditions or prone to seizures. Attraction may include the use of fog juice." Are you kidding me?! I don't know what the heck fog juice is, but I am so there. In addition to being infested with the undead, San Diego abounds with great timeshare options. I suggest checking out the San Diego Zoo and LegoLand in nearby Carlsbad, while you are in the area. In the southeast, Charleston, SC, is your best bet for fright-seeing. Aside from being one of this country's oldest established European settlements, and an impeccably preserved seaside colonial experience, the entire place is haunted. That's right, they even have an officially recognized "haunted district". And get this, they've got a bona fide dungeon. That's right, a pre-revolutionary hell-hole where pirates, criminals, and the like spent their last days before heading into the next world. Seems as though some of them have stuck around to this day. Charleston Ghost & Dungeon Walking Tours provide a great way to see one of the most haunted places in America, as recognized by the Travel Channel. Many timeshare rental options are available in and around Charleston Harbor. Well, I gotta go work on my Halloween costume. No I'm not going trick-or-treating, but I am going to participate in the nation's largest public Halloween celebration. 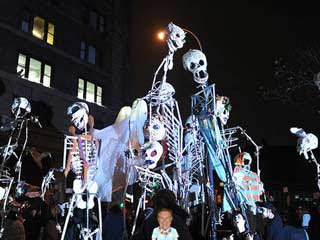 That's right, New York City's own Village Halloween Parade. The nation's only major night time parade is attended by over two million visitors and the procession itself is over a mile long. You've never seen so many giant masks, puppets, marching bands, stilt walkers, jugglers, break dancers, and drag queens in one place in your life. This year's theme is "Memento Mori" or "Remembrance of Death" in tribute to the Day of the Dead skeleton costumes popular in Mexico, Haiti, New Orleans, and elsewhere. Which is great, not only because black is slimming, but because my original costume idea didn't work out. I was planning on going as Lady Gaga, but apparently to get enough prosciutto to cover my body would set me back about ten grand.